WISER successfully hosted the hands-on portion of the Department of Cardiothoracic Surgery�s Annual Benign Esophageal Conference on Thursday May 14th 2015. The didactic portion of the program was presented by guest faculty Jeffrey M. Marks, MD, FACS, FASGE Professor of Surgery and Director of Surgical Endoscopy from Case Western University in Cleveland, OH. 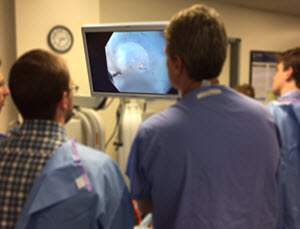 Trainees and practicing physicians from UPMC and outside institutions, spent the afternoon rotating through stations to review and practice procedures including Per-Oral Endoscopic Myotomy (POEM), Esophageal Endoscopic Mucosal Resection (EMR), Stents and Overstitch endoscopic suturing. 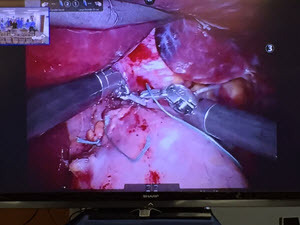 While the participants were going through each station, a simulcast of a live procedure, led by James D. Luketich, MD, FACS, was broadcast for the participants to view. WISER looks forward to hosting this portion of the conference again next year.